I don't even know i can put into words HOW AMAZING this band was for our wedding this past weekend! Tom & his band kept the energy up the entire night! My guests are STILL talking about how awesome they were. Tom made our wedding personal, SO much fun, & had a Perfect song line-up for the entire evening! Book Tom NOW! He was phenomenal & you will not regret this band ONE BIT! Thank you guys for such a Memorable night. This band was worth every penny! Everybody was dancing from the very beginning of the reception!! Just added so much to our amazing wedding!! Thank you! Tom Sartori Band will not disappoint you!!! They ROCKED the house!! Our guest are still raving about our wedding band!!! We could not have chose a better band for our wedding!!! Were hoping they play locally soon so we can just go and watch them!!! Thank you Tom!! Tom and his band played our wedding ceremony, cocktail hour, reception AND DJed the after party. He was a pleasure to work with and all of our guests raved about the performance. Thanks Tom!!! WOW!! I knew Tom was amazing because I saw him perform 10 years ago. I had also heard from several people that he was the BEST. I'm not sure if I can truly exemplify how the word "BEST" describes how extremely talented this guy is. It might even be an understatement. I would love to invent a word that combines, BEST, Phenomenal, Sensational, and Freakin Top of the Charts. Tom far exceeded our expectations!! Our entire wedding was on the dance floor the whole night. We not only received rave feedback from how it was the most amazing performance that any of my friends and family had ever seen at a wedding before, but we truly felt like we were at our own front row concert. Tom lit up the room with his style. He adapted to the vibe and the people by playing music that fit the crowd and was versatile in his music strengths to continue to capture the room. What's even more fun about Tom is that he engages the entire dance floor with his upbeat personality. I contribute the entire evening of laughter, crazy dance moves, (seeing even our shy friends perform moves I've never seen before), and the most memorable of songs played live to Tom. If I was budgeting for anything to make your evening as incredible as mine, I'd make hiring his band the number 1 on my list. I can't thank him enough for the impact he made on my wedding night. And I will never forget this experience with him as my band!!! Shortly after my husband and I were engaged , we started looking for a band to play at our Key West Wedding. My husband found the Tom Sartori band online and we hired them based on their great reviews and the videos we saw online . We had the opportunity to go see the band perform twice in ft Lauderdale prior to the wedding and get to know them . Each time we see them, the get better and better . They were amazing the day of the wedding . It turned the wedding reception into a full dance party and everyone was blown away with how incredible they were . I will 100% be hiring The Tom Sartori band for future events! I can't possibly say enough about how amazing, talented and out of this world GREAT Tom Sartori Band is!!! They MADE the wedding!! From the ceremony, to cocktail hour, to reception, they BLEW US AWAY and our guests were raving about them weeks after the wedding!!! There isn't another band around that comes close to these guys. They're CRAZY talented and seriously the best I've ever seen. I wish I could hire them for something every month, I wish I could see them play every weekend. There wasn't a song they didn't know or couldn't perform and they were fun, memorable and out of this world. There is no need to look any further than Tom Sartori Band. I'm telling you, you'll never find a better band than them! Tom Sartori and his band were literally the best! My wife put me in charge of the music for the big day, and I searched long and hard for a band. Finally I found Tom and was super impressed by his music. We chose the 3 piece band (because that's all our budge permitted) and also had Tom perform at the ceremony and cocktail hour...I do have to admit, I was nervous because I wasn't sure 3 pieces would be able to create the atmosphere we were looking for. Also, Tom's website doesn't have a single video of him with the 3 piece option, so I was a bit stressed about it....The truth is, if I spent even 1 second worrying about it, it was 1 second to long. Let me be very clear. TOM. WAS. THE. BEST! He kept everyone dancing all night, and he even played every song from a long list of songs that we liked (Dance, top 40, a waltz for our grandparents, you name it...) He even took some of the songs and mashed them up. Everyone still tells us that it was the best live music (let alone wedding music) that they have heard. If you are on the fence about it, just book Tom, it will be amazing no doubt. In terms of the the logistical stuff: Tom was responsive, friendly, etc etc etc etc. I have NO complaints about anything. On the day of the wedding, he set up 3 areas (ceremony, cocktail hour, reception) and moved throughout them seamlessly. Even though I didn't get to partake in the cocktail hour, all our guests said it was amazing and that the violinist even walked around the room and played the whole time. AWESOME. Moral of the story..Tom was worth every single penny. Not only did he make our wedding an amazingly special day/party. We truly feel like we have a new friend. Cheers, Tom. Thanks again! Tom and his band were excellent! They played a great show and all the guests commented on how wonderful they were. We are big music critics and go to a lot of live concerts so the music at our wedding was important to us. These guys are not your typical cheesy wedding band. They're professional and knowledgable when it comes to weddings and very talented! I'm not even sure how to put into words how amazing the Tom Sartori Band were at my wedding. Besides being nice, easygoing guys, they are some of the most talented musicians I've ever seen perform. I had a beach wedding/reception and gave Tom a general idea of the kind of music I wanted for the night. Rather than bug me with the playlist, Tom took care it himself, knowing I had so many other things to worry about... And it was PERFECT! There were songs for everyone - oldies, country, pop, you name it. I booked the 4 piece band and everything they played sounded so amazing. The entire night I had my guests coming up to me telling me it was the best band they'd ever heard at a wedding, and I agree completely! Half way through the song that my husband and mother-in-law were dancing to, there was a torrential downpour. Rather than stop playing and run for cover to protect their instruments, the band continued to play through the whole song, not wanting to ruin my husband and mother-in-law's moment; that's just how amazing these guys are (not many bands would do that!). To top it off, they moved into our backup venue and played longer than we originally booked them for. Had they not done this, I would have had my guests dancing to songs playing off my phone the whole night. They literally saved the day. They took requests, and knew every single song we asked for. In my opinion, bands either make or break a wedding reception. The Tom Sartori Band were more than I could have hoped for. If you're even thinking about booking them, do it immediately and consider it the best decision you've made in a long time. If I ever need a band for an event again, I will be calling these guys up. From his beautiful rendition of “All of Me” and “Chasing Cars” during the ceremony through the very last note of the reception, Tom Sartori was the highlight of our wedding. Also, most impressive was the addition of an electric violinist. Early on we mentioned a local band we loved that featured an electric violinist. Tom surprised us at our wedding by including a phenomenal fiddler who had just finished a tour with Cirque de Soleil. From the ceremony to the cocktail hour and throughout the reception Tom and his band performed to perfection. He performed many of the songs we’d requested and wowed our guests time and again with his renditions of some of our favorite rock and alternative music, turning them into an energetic, danceable frenzy all night long. Included in the mix were some reggae, old school, country and pop favorites. The dance floor was constantly packed and those that didn’t dance were treated to a concert-like performance. All of our guests were complimenting us throughout the night at our wonderful choice in hiring Tom Sartori Band. Tom Sartori is a talented singer, songwriter, musician and performer. 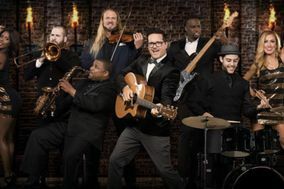 If you have the opportunity for this band to perform at your wedding or event, you and your guests will be treated to some the best live entertainment we’ve ever experienced. Amazing entertainer for a reasonable price! Had everyone on the dance floor all night long! Could not recommend him enough! Both my husband and I had seen Tom play at bars in Orlando and Gainesville during our college years, so we loved the idea of having him for our wedding. He was absolutely, without a doubt, the best money spent on our wedding! Tom played our ceremony and cocktail hour as a solo acoustic act, then had a full band for the reception. He learned all of the songs we wanted for the ceremony and first dances, then played an awesome mix of Top 40's, Pop, Dance, '80's, country, etc for the reception. The dance floor was packed all night and guests begged him to play one more song at the conclusion of the reception. He was so fun and sweet throughout the night and even called my dad up on stage to sing with him. It was a truly amazing and memorable experience to have had him for our wedding. I would encourage any bride interested in live music for your wedding to contact Tom first!! Great sound, great guys, 100% top notch professional entertainment. Couldn't ask for anything better. They not only put on a show for a wedding, they put on a concert for our guests who didn't get up and dance but still wanted to enjoy the entertainment. It made the night. They were amazing!!! Our guest are still talking about how wonderful they were!! They were worth every penny. Tom and his band absolutely rocked. The instrumental accompaniment for the ceremony was lovely and the acoustic background music during cocktail hour on the beach was great. They really brought the energy once the reception started, keeping the dance floor packed for the rest of the night! Their rendition of 'Africa' by Toto was a crowd favorite, we highly recommend it! I booked Tom to perform solo for cocktail hour, DJ for dinner, and with his band for our wedding reception in Naples in May 2015. Let me start by saying I'm a tough music critic. I regularly attend concerts and live music events as well as I'm an amateur musician myself. I booked Tom over the multitude of other wedding bands because the others seemed too cheesy. Tom promised over and over that he'd gauge the crowd's interest and keep everyone dancing. Let me tell you, he 100% delivered. Starting with the cocktail hour, it was spot on. Tom is both a talented guitarist and keys player, but his true talent is his voice. He improvises with well-known songs to add to their appeal. For the reception he absolutely killed it. I had numerous people tell me it was the most fun reception they've ever been to and I have Tom to thank. People were tossing around words like "phenomenal" and "amazing". Due to some technical issues during the DJ portion of the dinner (occasional static due to faulty wires), Tom playing his guts out for longer than the contracted time and more than made up for it. If I had to book a band for another occasion, I wouldn't think about looking elsewhere and we hope to get him up here in NYC to perform some time. Having a destination wedding (as was our case) can be a bit more stressful than a local one for several reasons. One simple fact remains that you end up working with people that you probably have never met (but communicate over time using email, phone etc.) or may not meet until ‘the big day.’ We did not have the luxury to get ‘local’ recommendations and simply relied upon the exceptional people that we worked with for guidance. Tom Sartori is one such example of an exceptionally talented artist. Here is what you get when you work with Tom: first and foremost expertise; he is a musician FULL TIME. Not like some of these other so-called ‘wedding bands’ where the guitar player is a line cook at the local Olive Garden during the week and plays at weddings for some ‘extra cash’. Tom is a professional, courteous. He was always accessible and able to customize his band and set-list based upon our budget; you can hire just him (which would be more than enough for most events) or ask him to add bass and drums or a full-on 12 piece; scalability is key and a point of differentiation. Most importantly, Tom was humble. He genuinely feels blessed that he can share his talent with others and will consult with you to deliver lasting memories for all. As far as I am concerned, there are only 2 people to consider for your wedding: Tom Sartori and everyone else. Sign him up now before someone else does. Awesome Band...Rocked the House! Book these guys and the dance floor will be packed.